Helps Boost Mood, Control Anger & Body Temperature. Widely used against Obesity, PMS, Depression & Insomnia. Can stop craving for Fats & Carbohydrates. The lifestyle and dietary practices of many people living in this stress filled era results in lowered levels of serotonin within the brain. As a result, many people are overweight, crave sugar and other carbohydrates, experience bouts of depression, get frequent headaches, and have vague muscle aches and pain. All of these maladies are correctable by raising brain serotonin levels. Nearly all 5-HTP is extracted from the seeds of the Griffonia simplicifolia plant - native to west Africa. Increases production of serotonin which can help boost mood, controls anger and body temperature just to name a few. Widely used against obesity (dieting), PMS, depression and insomnia making Body By Natures supplement both versatile and effective. Taking 5-HTP supplements can stop the craving for fats and carbohydrates. 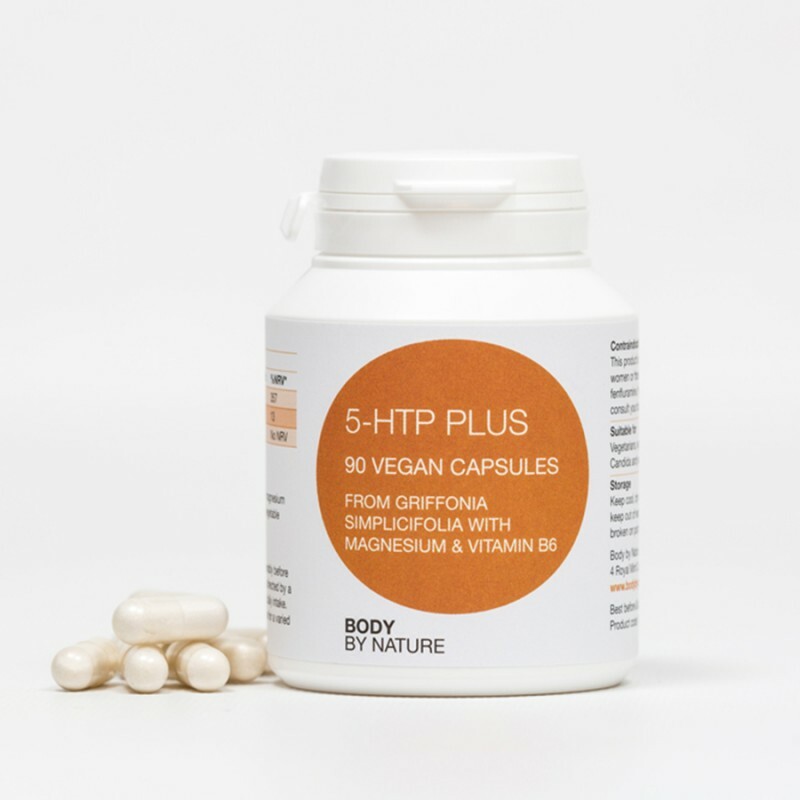 What is Vegan 5-HTP and Serotonin? 5-Hydroxytryptophan (5-HTP) is an amino acid that is the intermediate step between tryptophan and the important brain chemical serotonin. Extensive research has shown that due to the way we live currently live our lives, low serotonin levels are a common consequence. We can also expect lower amounts of serotonin within the brain due to the pressures and stresses of life. As a result, many people are overweight, crave sugar and other carbohydrates, experience bouts of depression, get frequent headaches, and have vague muscle aches and pain. Griffonia simplicifolia extract providing 5-Hydroxytryptophan, Magnesium citrate, Pyridoxal-5-phosphate, capsule shell (vegetable cellulose). This product is not suitable for pregnant or lactating women or those taking appetite suppressants containing fenfluramine. If you are on anti-depressant medication, consult your doctor before use.